Aluminum foil is made from an aluminum alloy which contains between 92 and 99 percent aluminum. Usually between 0.00017 and 0.0059 inches thick, foil is produced in many widths and strengths for literally hundreds of applications. It is used to manufacture thermal insulation for the construction industry, fin stock for air conditioners, electrical coils for transformers, capacitors for radios and televisions, insulation for storage tanks, decorative products, and containers and packaging. The popularity of aluminum foil for so many applications is due to several major advantages, one of the foremost being that the raw materials necessary for its manufacture are plentiful. Aluminum foil is inexpensive, durable, non-toxic, and greaseproof. In addition, it resists chemical attack and provides excellent electrical and non-magnetic shielding. Shipments (in 1991) of aluminum foil totaled 913 million pounds, with packaging representing seventy-five percent of the aluminum foil market. Aluminum foil's popularity as a packaging material is due to its excellent impermeability to water vapor and gases. It also extends shelf life, uses less storage space, and generates less waste than many other packaging materials. The preference for aluminum in flexible packaging has consequently become a global phenomenon. In Japan, aluminum foil is used as the barrier component in flexible cans. In Europe, aluminum flexible packaging dominates the market for pharmaceutical blister packages and candy wrappers. The aseptic drink box, which uses a thin layer of aluminum foil as a barrier against oxygen, light, and odor, is also quite popular around the world. Aluminum is the most recently discovered of the metals that modern industry utilizes in large amounts. Known as "alumina," aluminum compounds were used to prepare medicines in ancient Egypt and to set cloth dyes during the Middle Ages. By the early eighteenth century, scientists suspected that these compounds contained a metal, and, in 1807, the English chemist Sir Humphry Davy attempted to isolate it. Although his efforts failed, Davy confirmed that alumina had a metallic base, which he initially called "alumium." Davy later changed this to "aluminum," and, while scientists in many countries spell the term "aluminium," most Americans use Davy's revised spelling. In 1825, a Danish chemist named Hans Christian Ørsted successfully isolated aluminum, and, twenty years later, a German physicist named Friedrich Wohler was able to create larger particles of the metal; however, Wohler's particles were still only the size of pinheads. In 1854 Henri Sainte-Claire Deville, a French scientist, refined Wohler's method enough to create aluminum lumps as large as marbles. Deville's process provided a foundation for the modern aluminum industry, and the first aluminum bars made were displayed in 1855 at the Paris Exposition. he and several partners founded the Pittsburgh Reduction Company, which produced the first aluminum ingots that year. Using hydroelectricity to power a large new conversion plant near Niagara Falls and supplying the burgeoning industrial demand for aluminum, Hall's company—renamed the Aluminum Company of America (Alcoa) in 1907—thrived. Héroult later established the Aluminium-Industrie-Aktien-Gesellschaft in Switzerland. Encouraged by the increasing demand for aluminum during World Wars I and II, most other industrialized nations began to produce their own aluminum. In 1903, France became the first country to produce foil from purified aluminum. The United States followed suit a decade later, its first use of the new product being leg bands to identify racing pigeons. Aluminum foil was soon used for containers and packaging, and World War II accelerated this trend, establishing aluminum foil as a major packaging material. Until World War II, Alcoa remained the sole American manufacturer of purified aluminum, but today there are seven major producers of aluminum foil located in the United States. Continuous casting is an alternative to melting and casting aluminum. An advantage of continuous casting is that it does not require an annealing (heat treatment) step prior to foil rolling, as does the melting and casting process. the cost of transporting it, these plants are often situated as close as possible to the bauxite mines. Extracting pure aluminum from bauxite entails two processes. First, the ore is refined to eliminate impurities such as iron oxide, silica, titania, and water. Then, the resultant aluminum oxide is smelted to produce pure aluminum. After that, the aluminum is rolled to produce foil. 1 The Bayer process used to refine bauxite comprises four steps: digestion, clarification, precipitation, and calcination. During the digestion stage, the bauxite is ground and mixed with sodium hydroxide before being pumped into large, pressurized tanks. In these tanks, called digesters, the combination of sodium hydroxide, heat, and pressure breaks the ore down into a saturated solution of sodium aluminate and insoluble contaminants, which settle to the bottom. 2 The next phase of the process, clarification, entails sending the solution and the contaminants through a set of tanks and presses. During this stage, cloth filters trap the contaminants, which are then disposed of. After being filtered once again, the remaining solution is transported to a cooling tower. 3 In the next stage, precipitation, the aluminum oxide solution moves into a large silo, where, in an adaptation of the Deville method, the fluid is seeded with crystals of hydrated aluminum to promote the formation of aluminum particles. As the seed crystals attract other crystals in the solution, large clumps of aluminum hydrate begin to form. These are first filtered out and then rinsed. 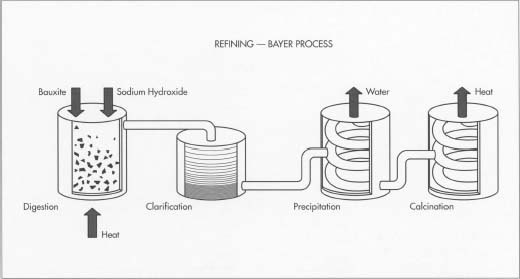 4 Calcination, the final step in the Bayer refinement process, entails exposing the aluminum hydrate to high temperatures. This extreme heat dehydrates the material, leaving a residue of fine white powder: aluminum oxide. 5 Smelting, which separates the aluminum-oxygen compound (alumina) produced by the Bayer process, is the next step in extracting pure, metallic aluminum from bauxite. Although the procedure currently used derives from the electrolytic method invented contemporaneously by Charles Hall and Paul-Louis-Toussaint Héroult in the late nineteenth century, it has been modernized. First, the alumina is dissolved in a smelting cell, a deep steel mold lined with carbon and filled with a heated liquid conductor that consists mainly of the aluminum compound cryolite. 6 Next, an electric current is run through the cryolite, causing a crust to form over the top of the alumina melt. When additional alumina is periodically stirred into the mixture, this crust is broken and stirred in as well. As the alumina dissolves, it electrolytically decomposes to produce a layer of pure, molten aluminum on the bottom of the smelting cell. The oxygen merges with the carbon used to line the cell and escapes in the form of carbon dioxide. 7 Still in molten form, the purified aluminum is drawn from the smelting cells, transferred into crucibles, and emptied into furnaces. At this stage, other elements can be added to produce aluminum alloys with characteristics appropriate to the end product, though foil is generally made from 99.8 or 99.9 percent pure aluminum. The liquid is then poured into direct chill casting devices, where it cools into large slabs called "ingots" or "reroll stock." After being annealed—heat treated to improve workability—the ingots are suitable for rolling into foil. Foil is produced from aluminum stock by rolling it between heavy rollers. Rolling produces two natural finishes on the foil, bright and matte. As the foil emerges from the rollers, circular knives cut it into rectangular pieces. 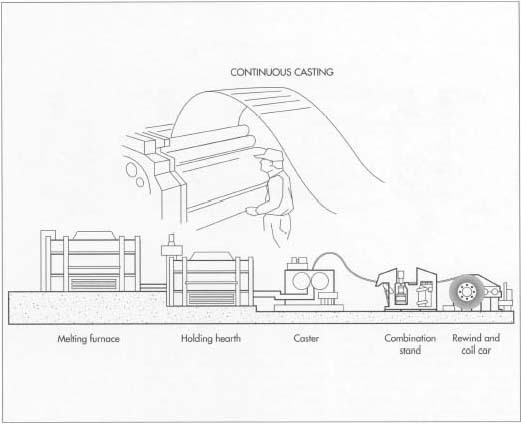 An alternative method to melting and casting the aluminum is called "continuous casting." This process involves a production line consisting of a melting furnace, a holding hearth to contain the molten metal, a transfer system, a casting unit, a combination unit consisting of pinch rolls, shear and bridle, and a rewind and coil car. Both methods produce stock of thicknesses ranging from 0.125 to 0.250 inch (0.317 to 0.635 centimeter) and of various widths. The advantage of the continuous casting method is that it does not require an annealing step prior to foil rolling, as does the melting and casting process, because annealing is automatically achieved during the casting process. 8 After the foil stock is made, it must be reduced in thickness to make the foil. This is accomplished in a rolling mill, where the material is passed several times through metal rolls called work rolls. As the sheets (or webs) of aluminum pass through the rolls, they are squeezed thinner and extruded through the gap between the rolls. The work rolls are paired with heavier rolls called backup rolls, which apply pressure to help maintain the stability of the work rolls. This helps to hold the product dimensions within tolerances. The work and backup rolls rotate in opposite directions. 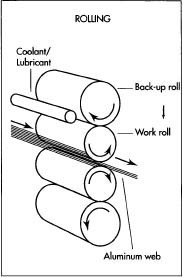 Lubricants are added to facilitate the rolling process. During this rolling process, the aluminum occasionally must be annealed (heat-treated) to maintain its workability. The reduction of the foil is controlled by adjusting the rpm of the rolls and the viscosity (the resistance to flow), quantity, and temperature of the rolling lubricants. The roll gap determines both the thickness and length of the foil leaving the mill. This gap can be adjusted by raising or lowering the upper work roll. Rolling produces two natural finishes on the foil, bright and matte. The bright finish is produced when the foil comes in contact with the work roll surfaces. To produce the matte finish, two sheets must be packed together and rolled simultaneously; when this is done, the sides that are touching each other end up with a matte finish. Other mechanical finishing methods, usually produced during converting operations, can be used to produce certain patterns. 9 As the foil sheets come through the rollers, they are trimmed and slitted with circular or razor-like knives installed on the roll mill. Trimming refers to the edges of the foil, while slitting involves cutting the foil into several sheets. These steps are used to produce narrow coiled widths, to trim the edges of coated or laminated stock, and to produce rectangular pieces. For certain fabricating and converting operations, webs that have been broken during rolling must be joined back together, or spliced. Common types of splices for joining webs of plain foil and/or backed foil include ultrasonic, heat-sealing tape, pressure-sealing tape, and electric welded. The ultrasonic splice uses a solid-state weld—made with an ultrasonic transducer—in the overlapped metal. 10 For many applications, foil is used in I V / combination with other materials. It can be coated with a wide range of materials, such as polymers and resins, for decorative, protective, or heat-sealing purposes. It can be laminated to papers, paperboards, and plastic films. It can also be cut, formed into any shape, printed, embossed, slit into strips, sheeted, etched, and anodized. Once the foil is in its final state, it is packaged accordingly and shipped to the customer. In addition to in-process control of such parameters as temperature and time, the finished foil product must meet certain requirements. For instance, different converting processes and end uses have been found to require varying degrees of dryness on the foil surface for satisfactory performance. A wettability test is used to determine the dryness. In this test, different solutions of ethyl alcohol in distilled water, in increments of ten percent by volume, are poured in a uniform stream onto the foil surface. If no drops form, the wettability is zero. The process is continued until it is determined what minimum percent of alcohol solution will completely wet the foil surface. Other important properties are thickness and tensile strength. Standard test methods have been developed by the American Society For Testing and Materials (ASTM). Thickness is determined by weighing a sample and measuring its area, and then dividing the weight by the product of the area times the alloy density. Tension testing of foil must be carefully controlled because test results can be affected by rough edges and the presence of small defects, as well as other variables. The sample is placed in a grip and a tensile or pulling force is applied until fracture of the sample occurs. The force or strength required to break the sample is measured. The popularity of aluminum foil, especially for flexible packaging, will continue to grow. Four-sided, fin-sealed pouches have gained wide popularity for military, medical, and retail food applications and, in larger sizes, for institutional food service packs. Pouches have also been introduced for packaging 1.06 to 4.75 gallons (4-18 liters) of wine for both retail and restaurant markets, and for other food service markets. In addition, other products continue to be developed for other applications. The increase in popularity of microwave ovens has resulted in the development of several forms of aluminum-based semi-rigid containers designed specifically for these ovens. More recently, special cooking foils for barbecuing have been developed. However, even aluminum foil is being scrutinized in regard to its environmental "friendliness." Hence, manufacturers are increasing their efforts in the recycling area; in fact, all U.S. foil producers have begun recycling programs even though aluminum foil's total tonnage and capture rate is much lower than that of the easy-to-recycle aluminum cans. Aluminum foil already has the advantage of being light and small, which helps reduce its contribution to the solid waste stream. In fact, laminated aluminum foil packaging represents just 17/lOOths of one percent of the U.S. solid waste. For packaging waste, the most promising solution may be source reduction. For instance, packaging 65 pounds (29.51 kilograms) of coffee in steel cans requires 20 pounds (9.08 kilograms) of steel but only three pounds (4.08 kilograms) of laminated packaging including aluminum foil. Such packaging also takes up less space in the landfill. The Aluminum Association's Foil Division is even developing an educational program on aluminum foil for universities and professional packaging designers in order to help inform such designers of the benefits of switching to flexible packaging. Aluminum foil also uses less energy during both manufacturing and distribution, with in-plant scrap being recycled. In fact, recycled aluminum, including cans and foil, accounts for over 30 percent of the industry's yearly supply of metal. This number has been increasing for several years and is expected to continue. In addition, processes used during foil manufacturing are being improved to reduce air pollution and hazardous waste. Aluminum Foil. The Aluminum Association. 1981. "Barrier Qualities Stimulate Aluminum Foil Packaging Growth," FoilPak News. The Aluminum Association. Fall, 1992. "The Best Ways to Keep Food Fresh: A Roundup of the Most Effective and Most Economical Wraps, Bags, and Containers," Consumer Reports. February, 1989, p. 120+. Gracey, Kathryn K. "Aluminum in Microwaves," Consumers' Research Magazine. January, 1989, p. 2. "Promote Even Cookery with Foil," Southern Living. December, 1987, pp. 130-131. The artical is good but it needs some more new topics like rolling mills, anneling.